Most agents consider ‘full service’ to mean brochures and open houses once a home is on the market,” says Conrad Steller, founder of The Steller Group. However, Steller believes it is the agent’s responsibility to properly prepare a home for sale well in advance. “Ninety percent of our work happens before we list a home,” says Steller. 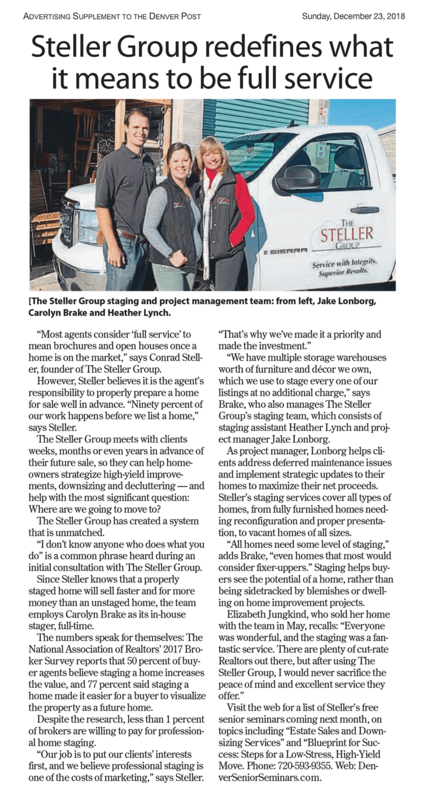 The Steller Group meets with clients weeks, months or even years in advance of their future sale, so they can help homeowners strategize high-yield improvements, downsizing and decluttering — and help with the most significant question: Where are we going to move to? The Steller Group has created a system that is unmatched. “I don’t know anyone who does what you do” is a common phrase heard during an initial consultation with The Steller Group. Since Steller knows that a properly staged home will sell faster and for more money than an unstaged home, the team employs Carolyn Brake as its in-house stager, full-time. The numbers speak for themselves: The National Association of Realtors’ 2017 Broker Survey reports that 50 percent of buyer agents believe staging a home increases the value, and 77 percent said staging a home made it easier for a buyer to visualize the property as a future home. 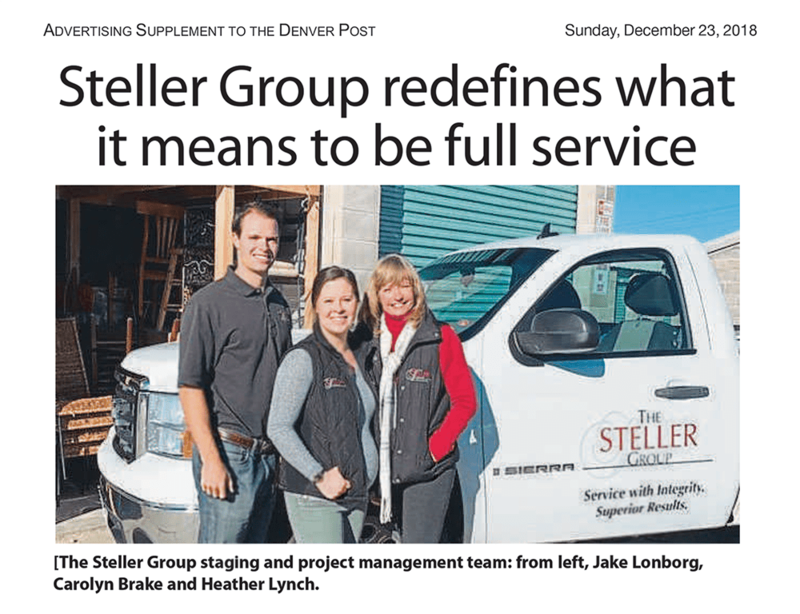 “We have multiple storage warehouses worth of furniture and décor we own, which we use to stage every one of our listings at no additional charge,” says Brake, who also manages The Steller Group’s staging team, which consists of staging assistant Heather Lynch and project manager Jake Lonborg. As project manager, Lonborg helps clients address deferred maintenance issues and implement strategic updates to their homes to maximize their net proceeds. Steller’s staging services cover all types of homes, from fully furnished homes needing reconfiguration and proper presentation, to vacant homes of all sizes. “All homes need some level of staging,” adds Brake, “even homes that most would consider fixer-uppers.” Staging helps buyers see the potential of a home, rather than being sidetracked by blemishes or dwelling on home improvement projects. Visit the web for a list of Steller’s free senior seminars coming next month, on topics including “Estate Sales and Downsizing Services” and “Blueprint for Success: Steps for a Low-Stress, High-Yield Move. Phone: 720-593-9355. Web: DenverSeniorSeminars.com.